She was working after hours on a big project with her boss. He had asked her for help. They were arranging some important documents when he drew close and kissed her. She pushed him away and spat. Don’t You Like Some Words More Than Others? Next ›I Love Short Stories. Don’t You? I like the Lichtenstein picture you’ve used with the story! I couldn’t actually find the name of the author. Who do you say he is? Alas, Daniel, rewriting Oliver’s biography. She act as a brave lady that is must for such type of men. ‘No,’ she said. ‘I resign.’ wow that’s my favorite part. The slapping part of course. 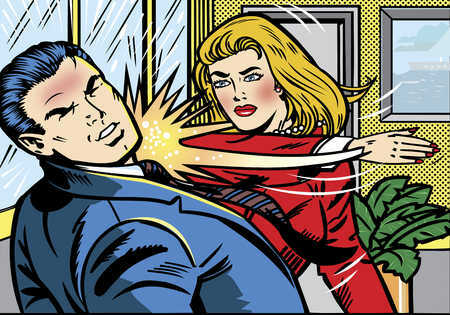 I like to be slapped by pretty women. Doesn’t happen often though. Damn… now she won’t get her severance pay!